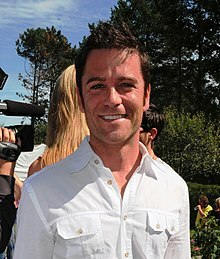 Yannick D. Bisson (born May 16, 1969) is a Canadian film and television actor and director best known to international audiences for playing Detective William Murdoch on the series Murdoch Mysteries. Bisson was born in Montreal, Quebec, and is of French and English ancestry. He moved to Toronto, Ontario, as a teenager and his acting career began when he was still in high school. His father, noting his son's interest in acting, encouraged him to reply to a newspaper advertisement seeking "child actors". Bisson's first major role was in the CBC's critically acclaimed 1984 movie of the week Hockey Night, alongside Megan Follows and Rick Moranis. He starred in the Canadian television series Learning the Ropes from 1988-89. From 1994-97, he starred in the syndicated action series High Tide, co-starring Rick Springfield. He moved back from Los Angeles to Vancouver, British Columbia in 1998 when he was cast as the lead in CBC'S Nothing Too Good for a Cowboy. From 2000-04, he had a recurring role as attorney Brian Tedrow on the Showtime drama Soul Food. He starred as the FBI agent Jack Hudson in the PAX TV series Sue Thomas: F.B.Eye and in the short-lived CBC drama Nothing Too Good for a Cowboy. He appeared on Falcon Beach in season two as well as in several Lifetime cable movies, such as Crazy for Christmas and I do (but I don't), and the Disney Channel movie Genius. Bisson was a guest star on Flashpoint and starred in the television movies Brothers by Choice and Keshan. He appeared as Jon in all of the Roxy Hunter movies to date. Bisson is featured in a series of commercials for CIBC. He starred in the 2001 TV movie Loves Music, Loves to Dance based on the book by Mary Higgins Clark. He provided the voice of Ferdie in the children's animated series Maxie's World. Bisson plays the lead in the CBC Television drama series Murdoch Mysteries and made his directorial debut with the show's fourth-season episode "Buffalo Shuffle". Starting on December 30, 2013, Bisson starred as a preschool teacher in The Adventures of Napkin Man on CBC Television. Bisson was awarded the Fan's Choice Award at the 2016 Canadian Screen Awards on March 13, 2016. Murdoch Mysteries was awarded the Canadian Screen Award Golden Screen Award for most watched, highest rated Canadian Drama in 2017 and 2018. Bisson received the ACTRA Toronto Award of Excellence in 2017 for his lifetime of work. Bisson was host of Discovery Canada Channel's Star Racer reality show. Bisson is married to actress Chantal Craig a former fitness instructor who currently works as a television content creator and writer. She now goes by the name Shantelle Bisson and has become an author. They met in high school and married when Bisson was 21. They have three daughters: Brianna, Dominique and Mikaela. Craig made guest appearances on two of Bisson's television series, Sue Thomas: F.B.Eye and Murdoch Mysteries. Their daughter played "Penny Renton" in an episode of Murdoch Mysteries entitled "Love and Human Remains." Dominique Bisson had a part as Gloria Abercrombie in an episode of Murdoch Mysteries, season 2, entitled "Snakes and Ladders". Bisson is also an avid bicycle collector and enjoys cycling in any free time possible. The actor enjoys biking as a way to relax and ground himself when his life starts to get hectic. Bisson formerly worked as a builder between acting jobs to support his family. Night Heat Regan Episode: "The Kid"
1988 Alfred Hitchcock Presents Ty Episode: "Twisted Sisters"
Street Legal Lennie Smith Episode: "Complex Offer"
1992 Tropical Heat Harry Jr. Episode: "Double Fault"
The Ray Bradbury Theater Roger (ages 18–22) Episode: "Some Live Like Lazarus"
1993 Matrix Rick Beals Episode: "Blindside"
Top Cops Mike Sheehan Episode: "Craig Gravel and Jerry Jones/Mike Sheehan and Stephen Davis"
Relic Hunter Stavros Vordalos Episode: "Myth of the Maze"
Twice in a Lifetime Julian Fanshaw Episode: "Mama Mia"
Mutant X Richard Saunders Episode: "Fool for Love"
Missing Bruce Skeller Episode: "Thin Air"
Playmakers Police Detective Episode: "Choice: Part 1"
2005 Kevin Hill Austin Brooks Episode: "Sacrificial Lambs"
The Dresden Files Sergeant Darren Munzer Episode: "Second City"
2010 Flashpoint Philip Sobol Episode: "Jumping at Shadows"
2011 The Listener Keith Shelton Episode: "Vanished"
Beauty and the Beast Alex Webster Episode: "Pilot"
Royal Canadian Air Farce Det. William Murdoch Episode: "Air Farce New Year's Eve 2012"
2014 Republic of Doyle Det. Bill Murdoch Episode: "If the Shoe Fits"
^ a b Zekas, Rita (December 29, 1991). "All-Canadian Guy Trades Skates for Horse". Toronto Star. p. C2. ^ Wesley, David (May 17, 1986). "Yannick Bisson: The Next Michael J. Fox?". Montreal Gazette. p. T8. ^ "Interview with Yannick Bisson by Kees Boer". www.positive-entertainment.com. Retrieved September 30, 2016. ^ Romanko, Karen A. Television's Female Spies and Crimefighters: 600 Characters and Shows, 1950s to the Present. Mcfarland & Co Inc Pub. p. 204. ISBN 978-0786496372. Retrieved September 30, 2016. ^ "Nothing Too Good for a Cowboy - TV Show, Episode Guide & Schedule". TWC Central. Retrieved September 30, 2016. ^ Grant, Stacey (June 22, 2016). "16 Questions I Had After Rewatching The Disney Channel Original Movie Genius". mtv.com. Retrieved September 30, 2016. ^ "Flashpoint: Jumping At Shadows". The Great Dark Wonder. September 13, 2010. Retrieved September 30, 2016. ^ "Yannick Bisson on the staying power of 'Murdoch Mysteries'". Toronto Sun. Retrieved September 30, 2016. ^ "'Murdoch' mysteries revealed". tvguide.ca. July 28, 2010. Retrieved January 29, 2011. ^ "New Show! Napkin Man is Coming Next Month - CBC Parents". Cbc.ca. November 19, 2013. Retrieved January 21, 2014. ^ "Canadian Screen Awards 2016: Murdoch Mysteries' Yannick Bisson Is The Fan's Choice". huffingtonpost.ca. TheHuffingtonPost.com, Inc. Retrieved March 14, 2016. ^ "2017 Award of Excellence | ACTRA Toronto". www.actratoronto.com. Retrieved February 28, 2017. ^ "Yannick Bisson receives ACTRA Award of Excellence". tribute.ca. February 26, 2017. ^ "Discovery Channel Goes Full Throttle with Star Racer - Search for Canada's Best Racer Takes to the Track Oct. 24". bce.ca. September 21, 2006. ^ "Star Racer". tv.com. Retrieved January 6, 2017. ^ "Yannick Bisson and His Wife Tackle Raising 3 Teenage Daughters". Parents Canada. April 11, 2012. ^ Zekas, Rita (December 28, 2002). "F.B. Eye Spy Who Came Up from the Warm". Toronto Star. p. J8. ^ Zekas, Rita (August 30, 2014). "At Home With the Man of Mystery". Toronto Star. p. H1. ^ "Yannick Bisson biodata". Cbc.ca. March 21, 2014. Retrieved May 9, 2014. ^ "At home with the man of mystery". thestar.com. Toronto Star. August 29, 2014. ^ "Murdoch Mysteries star Yannick Bisson sends it -". Canadian Cycling Magazine. April 6, 2014. Retrieved September 4, 2017. ^ Leblanc, Dave (September 19, 2013). "Peek Inside the Home of TV's Detective Murdoch". The Globe & Mail. Retrieved January 29, 2014. ^ "2017 ACTRA Awards in Toronto Nominees | ACTRA Toronto". www.actratoronto.com. Retrieved February 28, 2017. ^ Eng, David. "2015 Canadian Screen Awards – Winners in Drama, Children's or Youth, Comedy and Variety". chinokino.com. Retrieved February 28, 2017. Wikimedia Commons has media related to Yannick Bisson.